The presentation is a mix of slides and live demonstration of a microservices-based Sock Shop running in Google Compute Platform. Kentik ingests GCP flow records, parses the metadata, and displays exactly how the components of the Sock Shop are interacting with each other and the outside world. The data was created on-the-fly by the live attendees of this presentation browsing the demo Sock Shop. 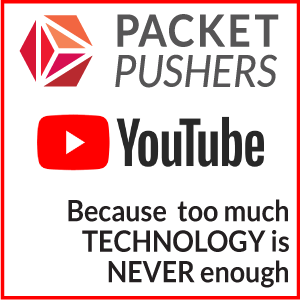 You can subscribe to the Packet Pushers’ YouTube channel for more videos as they are published. It’s a diverse a mix of content from the team of Ethan and Greg, plus selected content from our events. It’s sort of like our podcasts but with moving pictures.